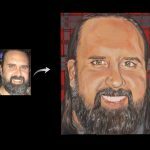 See this portrait I painted unfold in a time lapse video. My favorite part of this portrait was the beard, I love challenging myself and learning new techniques. So often portraits are thought of as for kids, babies, families; but I love the idea of a portrait of Dad. I loved getting to paint the masculine detail of the beard and eyebrows. This family actually got a painting of each of them on a separate canvas. They will be put together on the wall but I absolutely love this idea, as the little baby in their family grows they can change out and get a new portrait done of him, or if they have more children they can add another canvas. There isn’t an outdated feeling to their portraits as life continues on. I also love because if they change houses or where they put the portraits they can go from being together on one wall to going up the stairs or vertically on a tall wall, in various rooms, etc. It leaves so much more flexibility. I would love for you to see it. Next week I’ll share the baby portrait artwork video. If video doesn’t load you can find the video here. Feel free to leave a comment or a like on it to help others find it. Thanks!! Receive monthly doses of creative inspiration & be the first to see new artwork and specials!